What do you treasure the most about your summertime? Relaxing outside? Spending time with family and friends? Taking a trip “down the shore”? What do all of these favorites have in common ~ let me give you a hint….FOOD and entertaining? During the summer, we take the cooking outside and make it easier to stay cool & spend less time preparing. M&J Gourmet has got you covered for summertime entertaining & feeding your family! Republic of Tea Iced Teas – I make a batch weekly to keep in the fridge for my family and use a small amount of local honey as a sweetener. The bags are perfectly portioned to make a quart at a time. 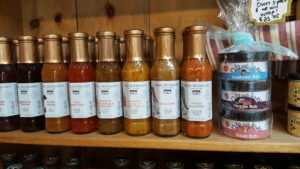 Stonewall Kitchen & Robert Rothschild Dips, BBQ & Grille Sauces, Marinades, Rubs – We have over 50 items in the shop for use on your grill, as a dip or appetizer, marinade or meat/ veggie rub. Hank Sauce Hot Sauces – made in NJ and packed with flavor and a manageable amount of heat! 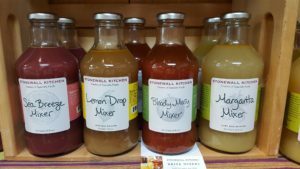 All Natural Drink Mixers – Stonewall Kitchen makes an amazing all natural drink mixers packed with flavor and very versatile. Each bottle has 3 recipes on the side and can be used with or without alcohol! Here are some of the flavors we have in store now: Blueberry Lemon Mint, Apple Cranberry, Lemon Drop, Margarita, Sangria, Sea Breeze, Bloody Mary, & Pomegranate Cosmo – Yum! Summertime Candies & Chocolates – including fudge made locally, salt water taffy, chocolate covered potato chips, truffles, chocolate covered pretzels & more! NEW PRODUCT LINE: WILD THYMES – made in NY, using only ingredient found in your pantry and full of flavor, these clean ingredient dips, marinades, sauces & chutneys are to die for! Limited time in store – purchase 2 or more and get 20% off!